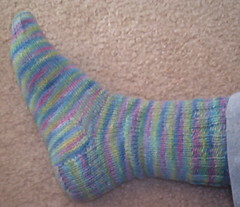 Nicole's Needlework: Sock is done! My sock is done! Yeah, I'm so excited!! It was so much fun!! and here it is on my foot... couldn't show any leg because it's not too pretty right now! Now on to number two! !